The youth are not always right, but the society which ignores them and beats, is always wrong. 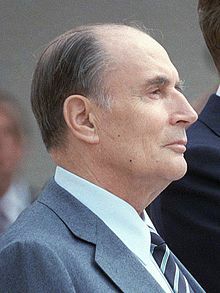 François Maurice Adrien Marie Mitterrand (October 26, 1916 – January 8, 1996) was a French politician. He was elected President of France in May 1981, re-elected in 1988 and held office until 1995. There exists in our country a solid continuity of Bonapartism, where the vocation for grandeur of France, the monarchist tradition, and the passion for national unity, the Jacobin tradition get together. To every reversal of people’s soveregnity, to every disappearance of the Republic corresponds a frank or disguised restitution in force of the regal justice. ‘’Tell me, according to what you judge and I’ll tell you who you are.” […] No axiom in politics is more certain than this. What has begun in this evening will not stay for a long time, and because you represent the forces of the world of labour, you, forces of the youth, your victory is inevitable. Behind each great man, there's a Richard Delisle. The man of the past. I believe in the forces of the spirit, and I won't leave you. "In such countries, genocide is not too important…"